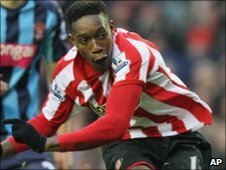 Sunderland striker Danny Welbeck will be out for up to eight weeks after undergoing exploratory knee surgery. Welbeck, 20, who is on a season-long loan from Manchester United, had an operation one day after former team-mate Darren Bent left for Aston Villa. Black Cats boss Steve Bruce confirmed: "He has a torn cartilage and he will be out for six to eight weeks." The news leaves Bruce with only one fit striker, Asamoah Gyan, for Saturday's Premier League game at Blackpool. Bruce joked: "Gyan is in cotton wool and we're all massaging every bit of his body to make sure he's ready for it." And the Black Cats boss is ruing the timing of Darren Bent's departure to Aston Villa this week. "The disappointing thing for me when Darren took the action to hand in a transfer request was the injury to Welbeck. It has put the club in a really difficult situation when we were going so well," he added. "If Danny had been OK, I'd have been very happy playing Danny with Gyan, it wouldn't have been a problem." Welbeck has enjoyed a successful season in the north east, scoring six goals in 22 appearances and although the trip to Bloomfield Road would have come too soon, Bruce expected to have his striker back for February. However, the exploratory surgery has ruled out any chance of that happening and Welbeck is now not expected to play again until March, which is roughly the time his team-mate Fraizer Campbell is expected to return after a six-month injury lay-off.